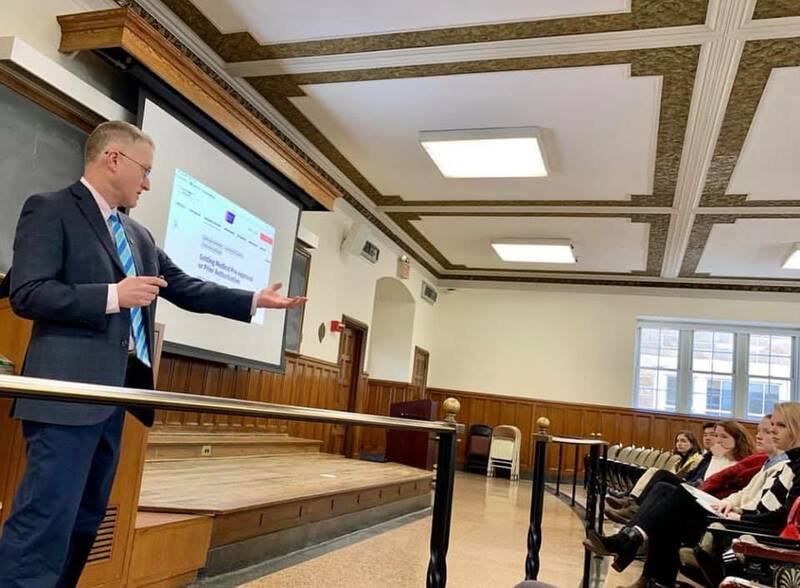 January 26, 2019 – WYA North America partnered with the Philosophy Department and the Center for Ethics Education at Fordham University (Bronx, NY) to host its Spring 2019 Emerging Leaders Conference. Entitled “The Person and Bioethics: Defending the Dignity of the Human Person in Modern Medicine,” the conference explored end of life bioethical issues through the lens of human dignity. It featured four outstanding speakers who provided an in-depth and comprehensive study of Bioethics in relation to the philosophy of the human person. Speakers spoke based on expert experience and studies in the areas of philosophy, law, and medicine. On Saturday morning, Philosophy Professor Christopher Tollefsen, PhD (University of South Carolina) highlighted two opposing schools of thought in approaches to medical praxis. He outlined how an approach focusing on the patient’s good above all else, aptly called “The Way of Medicine,” is preferable to an approach that absolutizes the patient’s autonomy. Afterwards, Dr. Peter Wicks, PhD (Elm Institute) continued the conference’s study of philosophy in his address entitled, “Images of the Human Person in the Practice of Medicine.” Dr. Wicks built on Dr. Tollefsen’s talk by exploring further how questions concerning human dignity enter into practical approaches to medicine. Finishing out the morning, Mary Rice Hasson (Catholic Women’s Forum) offered a presentation entitled, “Deconstructing the Human Person: Ethical Concerns around Gender Ideology.” Professor Hasson discussed how the contemporary medical field responds the phenomenon of gender dysphoria, and how this response typically fails to uphold the reality of the human person. In the afternoon, Dr. Dan Cruser MD concluded the conference with a talk entitled, “Erosion of the Physician Patient Relationship.” Dr. Cruser pulled from his extensive experience within the medical field to highlight how certain trends in contemporary medicine, such as hyper-corporatization, have negatively impacted the doctor/patient relationship. The conference engaged 50 participants from various institutions and universities including: Princeton, Columbia, Notre Dame, Boston College, Saint Rose, Saint Saviour High School, and Fordham University. WYA is grateful to all conference speakers, partner organizations, and participants for their contribution to the conference. It was a great pleasure for WYA to engage the Fordham community in these important discussions that pertain to the dignity of the human person.